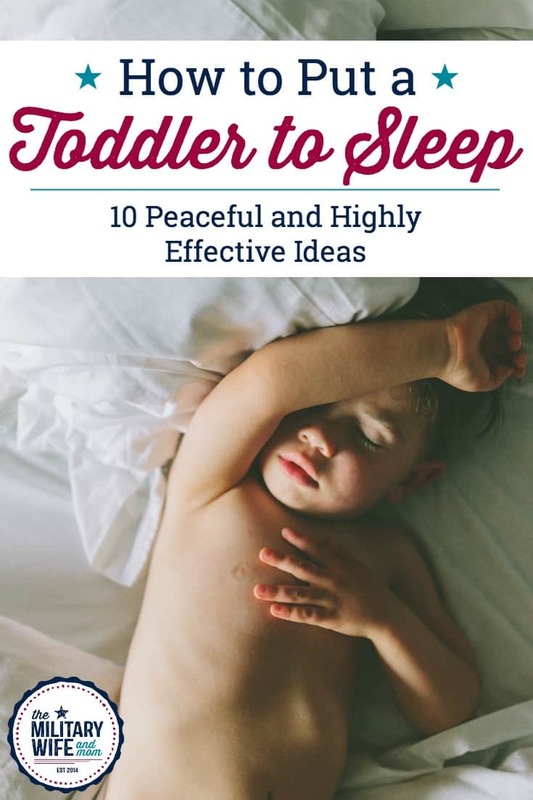 Inside: Are you struggling answer the question, “How to put a toddler to sleep fast?” After helping frustrated and exhausted parents for years, I’ve put my best kept secrets into one list for helping toddlers fall asleep faster than ever. Our bedtime battle reached the two hour mark. Round after round, my toddler daughter and I battled about her going to bed. I wanted her to sleep, and for two hours, she tried to prove me wrong. One night, I even took pictures of her little fingers sticking out the bottom of the bedroom door pleading with me to stay awake. I knew one day (probably 20 years later) this picture would bring a smile to my face. But that night, nothing was funny to me. That was months ago. In a few weeks time, we went from knock-down, drag-out battles to peaceful and cooperative bedtimes using a few different techniques. No matter if your toddler keeps getting out of bed, or your dealing with toddler tantrums at bedtime or something else, there is hope. I’m a firm believer that all kids are capable of going to bed peacefully and on their own. It’s only a matter of helping them see their abilities. How to put a toddler to sleep fast. Over the years, I’ve worked with countless parents struggling with toddlers sleep issues. I’ve put together my top ten best secrets for helping your toddler find their Inner Sleep Goddess. The best part? You can do this all without yelling, threatening or bribing your toddler to fall asleep fast. 1. Fill the needs: power, experience, connection. All kids have three basic needs: power, experience and connection. Everything your child is already doing is meeting those needs (This is part of Language of Listening® – the three-part parenting framework I use). When kids want to connect, they will fight bedtime and continue to come out of bed in order to connect. If kids feel powerless and desire control, they will fight bedtime in order to fill their need for power. And if kids want the experience of sleeping in your bed, they will continue trying to experience it if they don’t see another alternative. In order to help your child meet his or her need for connection, use SAY WHAT YOU SEE® . This is a technique where you describe what the child is doing, saying, feeling or thinking. This is the step of validation and connection for kids. If you don’t know what to say, a wonderful default I love to use is, “You wanted…” and then add in what the child wants, or wishes for in that moment. The more you use SAY WHAT YOU SEE with your kids, the more your child will feel heard and understood. When a child feels heard, he or she feels connected to you. Related: Two words that will tame temper tantrums – every time. If order to help your child meet his or her need for power, look for things your child CAN DO to feel in control. Meeting a child’s need for power is often overlooked, but it is usually the primary need at the beginning of a bedtime battle because children feel powerless when they can’t get what they want. 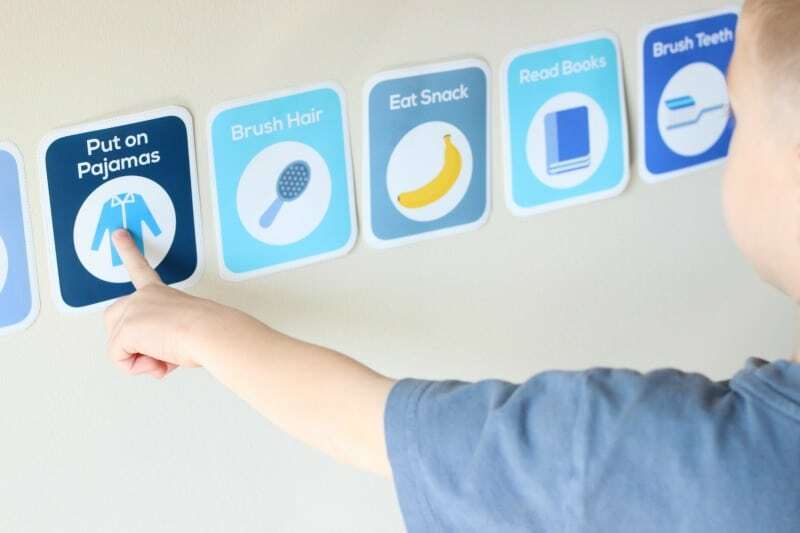 This might be choosing the pajamas they wear, the order of the bedtime routine, the books you read, or the game you play during teeth brushing. When kids feel in control, they stop trying to control others. To help your child meet his or her need for experience, grant your child’s wishes in fantasy. “You wish statements” help meet your child’s need for experience in fantasy when he or she wants something and can’t have it. The more detail you add, the more real it will feel to the child. If your child cracks a smile, starts to calm or joins into the fantasy story like mine do, you’ll know you’re on the right track. Once you’re on the right track, you can go back to SAY WHAT YOU SEE. When you follow along and validate, kids feel heard and understood. The added connection prevents escalation. 2. Play out struggles using games. Using play is a powerful tool to help your child stop using behaviors you don’t like and start using ones that you do. If your toddler keeps coming out of bed or your toddler keeps waking up at night or if you can’t figure out how to put a toddler to sleep fast, turn it into a game. Allow your child to play the role of the parent while you play the role of the child. Play your game during the day or long before it’s bedtime. Have your child tell you to stay in bed and stop coming out. Then cry in the room and try to sneak out. Allow your child to find you and put you back to bed. Follow the child’s lead with the game; let the child take you where they need to go. Kids know exactly what they need and will meet their needs (power, experience, connection) through play. Keep a close eye on how your child acts out the parent role — that’s likely how they perceive you during bedtime. You’ll know kids are on their way to meeting their own needs when they ask to play the child role again. Continue playing the game on a regular basis until the child asks to stop. 3. Use a visual routine – especially with toddlers. “In a large study across several countries, researchers found that having a consistent bedtime routine is directly related to better sleep: Children who had a regular bedtime routine fell asleep faster, had an earlier bedtime, had fewer night wakings and slept longer than children who did not have a regular bedtime routine! You can add another layer to your toddler’s routine using a daily printable schedule for kids. When toddlers see the routine, they are more cooperative and able to follow along. Eventually toddlers begin to follow the routine with less and less prompting, saving time! 4. Diffuse essentials oils for sleep support. There are many different essential oils for sleep support, but for kids, my favorites are cedarwood and lavender. Cedarwood essential oil supports healthy function of the pineal gland, which releases melatonin…the body’s natural sleepy hormones. Lavender is well-known for it’s relaxing and calming effects on the body. The reason I love this oil most is it’s safe to use on all ages–babies through adults. Before choosing an essential oil brand, be sure to extensively research purity standards. You definitely don’t want to put adulterated oils on your kids (they are stuffed with chemical fillers). One more that we love is called Tranquil. It’s a roll-on which makes it convenient and easy. I’ll frequently roll in onto my daughter’s wrists if she has trouble going to bed or falling asleep after a night-waking. 5. Treat sleep as a gift, not a punishment. If our son wouldn’t pick up the toys before bed, the consequence was not sleep. There was no more, “You’re going to bed right now.” Instead, if he didn’t pick up the toys, he lost the toys the next day. That was just the rule. Look for ways to re-frame your bedtime routine as a very special time with mom or dad. Then talk to your child about ways sleep benefits the brain and body, using language they can understand. Read more here: How to handle bedtime tantrums. 6. Use Success Training to help your child stay in bed. 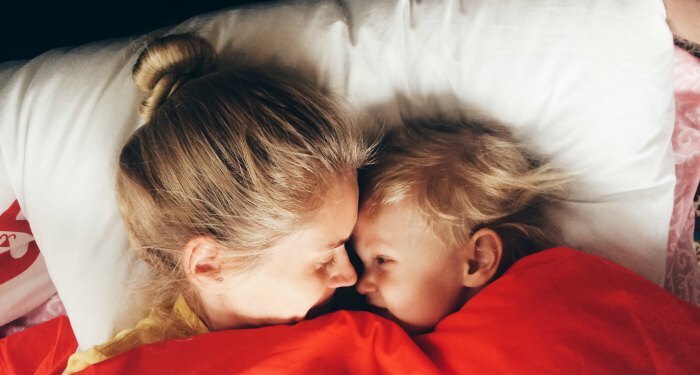 After going through your initial bedtime routine, start by offering to let your child set a time for you to check on him or her (like in 2-5 minutes) so she can experience success in staying alone and in bed, set a timer, and return on time a couple of times. Each time point out a STRENGTH — any little thing she did right–you didn’t move (stayed under the covers, on your bed, in your room like you said below) that whole time! After a couple of successes, point out that shows she trusts you to come back noting how long she stayed in his bed and how hard that must be since this is a new routine. Then see if she is ready to try another minute between visits (or 2 or 5 depending on how quickly she is adapting to this new routine), and try that a couple of times. Keep checking and extending until she is asleep. The first few nights it will take A LOT of your time, but you should see progress every night. As your child’s confidence grows, she will choose a longer time between visits, and you will know she is on her way to going to sleep on her own without a struggle. If she comes out before the time of the visit, she may not believe you right away or may be worried you is tricking her. If so, you can adjust the time down until you find the success point and restart there. It may go back a forth a while at first before seeing steady progress. Each time she finds a way to stay in bed or stay calm, name those STRENGTHs. Coaching your child, she can start to help herself through the situation. 7. Explore fears at bedtime, rather than ignore them. When kids are afraid of something, and they hear, “There’s nothing to be afraid of. You’re fine!” it creates a disconnect. In an effort to feel heard and understood, the child will intensify his communication to prove to you his fears are very real. The only way to help a child truly move past fear is to validate the feeling. Read more here: How to respond when your child’s afraid to sleep alone. Learning how to put a toddler to sleep fast is a huge challenge. Every child is different, which means that there is no right or wrong answer when finding solutions. We’ve used a combination of the above on and off with our kids when needed. After only a few weeks time, our daughter was back on track, cheerfully participating in her bedtime routine and peacefully falling asleep on her own. And remember…it’s only a sleep problem if it’s a sleep problem for you. Try different things and see what feels right to you. Trust your gut. I just LOVE all your articles! They are so informative and most of all they really work – to great effect! Thank you so much for taking the time to write these articles, which I’m sure help struggling parents everywhere to cope so much better. My Child is having night mares aboult things she sees or learns about during the day..
You need to start praying with your child and open your Bible to Psalm 99. Fbyou do t have one, get one because fear is not from God but rather from evil. Children need to know there is a higher power stronger than any monster or fear, otherwise they grow into fearful adults who end up taking anti depressants cause they can’t conquer their fears. God does love you and can prove you he exists if you seek him. May he bless your family. I need help. My overgrown toddler… 3 1/2 wont get off my bed. I am going to try the methods… but he was nursed and still wants to snuggle when tired at my breast. Yes he’s old… but never had this issue w my older kids.. it feels wrong to steal the snuggle. Yet, he needs to learn and love his growing independence. How do I approach this? Love these tips. 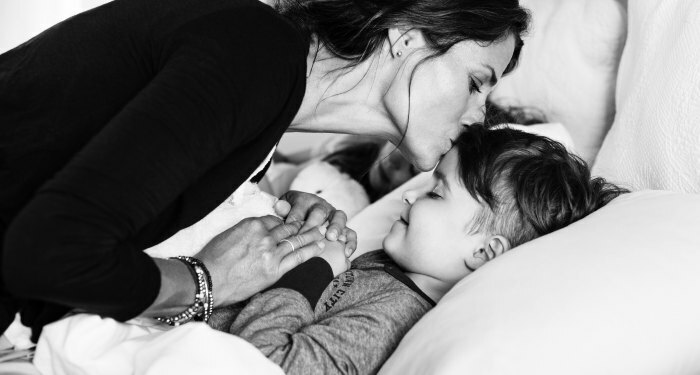 How would you modify this if going to sleep initially is basically ok but toddler wakes every 1-3 hours and doesn’t want to put himself to sleep without a parent in the room? My son is 2 year old. His never been a great sleeper but from about 11months he started sleeping through which was bliss. It’s been 4 weeks and now he wakes up at least twice through the night and is up at 5:30-6am in the morning which is really hard for a working mum. I have always had a bedtime routine from day one. Brush teeth, bath, pjs & milk then bedtime. It takes me over an hour to get him to sleep which I don’t mind if he sleeps through. I do try and talk to him but I don’t think he really understands. Any advice would be highly appreciated. These might work for some, but for a child that REALLY does not want to go to sleep, all this is useless. Books? Reading? My daughter is 2.5 years old and she cannot sit still enough for me to read FOUR WORDS ON A PAGE, let alone reading a whole baby book. Routine? We have had the same routine for ages. Doesnt do anything. Play games? Ya, my daughter can be up for 5 hours, playing ” go to sleep games”. She literally has to be confined and forced to go to sleep every night. Make sleep time fun? Yea right.. that was tried for months..after being up for 17 hours in a day, cleaning, cooking, changing diapers, feeding, cleaning toys hundreds of times, doing laundry, dishes, vacuuming, playing games, brushing teeth, giving a bath… I have lost my desire to play games with her at night time, simply because she has an endless amount of energy and until shes confined and forced to lay down and repeatedly told hundreds of times, night night, mummy loves you, night night, mommy loves you, shes still hyper as hell. And while at it, she gets plenty of walks outside, outside play, running alllllll day, jumping, climbing, etc. She takes a nap at noon, for an hour. ( and until she was one year old, she took MICRO NAPS- FOUR 20 MINUTES NAPS A DAY). Everything was tried. Even a sleep consultant that specializes in babies. They told me eventually to let her cry it out. No thank you. I wont let her scream for 4 hours until she’s passed out and puffy eyed because “mommy doesnt care about me”. I honestly have tried everything. Peaceful parenting . Even tried spanking as a last resort. Of course that didn’t work either so I stopped. For problematic toddlers, this list is a complete joke. Sorry. Just the opinion of an exausted and desperate mom, who simply cant handle the whole ” oh, just do this and your child will fall asleep fast” crappy advice, anymore.